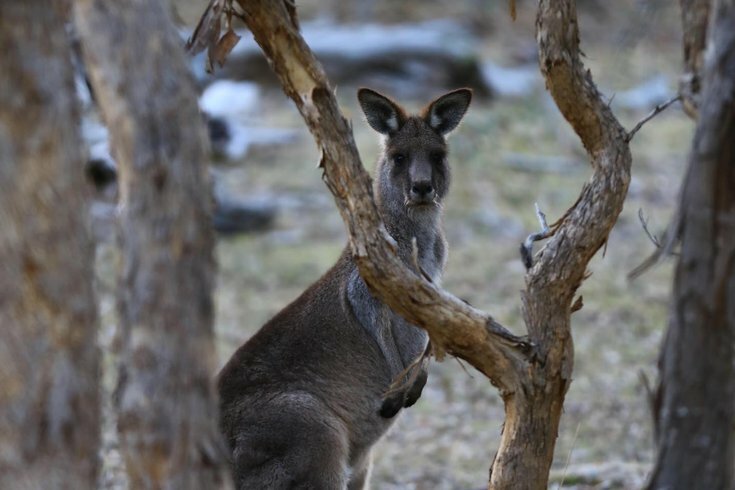 This is a kangaroo near the residential areas at the foot of Mount Ainslie, which was only about 10 minutes' drive to the city center of Canberra, Australia. A week after an alligator was on the loose in South Jersey, Pennsylvania has responded with an roaming animal of its own: a 3-year-old kangaroo named Rocko. It’s turning into a bizarro world petting zoo out there. "So this is gonna sound weird but I looked out my window and there was a kangaroo or something that looked like a kangaroo in my yard and isn’t if it was someone’s pet or but can you guys get the word out to be on the lookout out for this animal I did call state police Bc game commissions was closed but my dad wouldn’t let me try to capture other wise I would’ve." A capture attempt sure would've been bold. According to Penn Live, the farm’s owner, Brendon Kline, said Rocko escaped during a brutal storm on Aug. 31. Flooding from the storm damaged plenty of Kline’s enclosures on the farm. Kline set up a GoFundMe asking for help in repairing the farm after the storm, which can be found here. The farm has been a Brogue staple since 1987, and Kline took over the family business in 2011. As for finding Rocko, Kline told PennLive anyone who may see him should keep their distance and call him at (717) 770-8375.